Sunset Safari Park could be in danger of closing down! Zebra and his friends try to think about how to save their home, but they might have to go a little bonkers! This is an utterly bonkers book. I took this into the classroom to read to 30 5 year olds and to be honest I had no idea what to expect from them. I thought it was a bit of a nutty story but it turns out they absolutely loved it. The illustrations are beautiful and the colours really draw you in, this attracted me to the book before the title or the story as it really stood out. The zoo animals are all in despair, they are getting no visitors and they decide they need to do something to save the safari. The Zebra comes up with some wacky ideas, which leaves the penguin telling him he is bonkers. 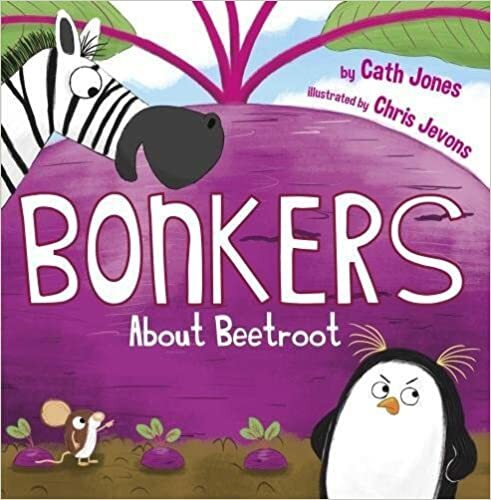 After some thought they decide to grow a beetroot, which gets so large they think it will attract visitors from miles around, but it gets too large and the story takes on an unexpected twist at the end. The children thought that this was funny and they now choose to read it independently during reading time.